3 months old, the second one, almost 5 months. Get The Original “Killer Guitar Control Secrets”! He’s definitely very cute, Claude. Congratulations again and thanks for all the great lessons. I love those little fingers, looks like a future player to me !!!!! He looks awesome!!!! What a handsome boy. I love those little fingers, looks like a player to me !!!! Thank you for sharing pics of you and your son! Blessings to your family! Thanks for sharing your family pics. It’s so clear to see that you have a new look on life and that your son will command your loving attention and guidance throughout his life. Congrats!! I’m the proud father of 3, and I miss that new baby smell. Beautiful work by the way. What a happy baby. Enjoy every moment. Thanks for sharing. What a beautiful baby! Our daughter will be thirty on Thursday – you’ll be surprised how quickly time passes! Got Daddy’s eyes. And so it begins, enjoy !!! I have three wonderful children all grown now. A chapter in life. P.S. Thanks for all the tips. Nice photos of you and your son Claude. By the look of that finger grip I think you might be having a drummer in the family. The very best wishes for you and your family. How did you have two babies 2 months apart? You’re good, man! You’re wife must be amazing! This will be a fantastic journey, wish you the best. Cute little guy. He’ll be reaching for your guitar before you know it. Great pictures! Congratulations, on becoming a dad. You’ll find out, quite a few years from now; that the only thing that compares, is becoming a grandfather. I really appreciate your web site, your online lessons and your video lessons. Now; there’s even more, to appreciate. Please post more pictures, from time to time. When you and the Misses came together as a loving couple the creator was there and bestowed a kindred spirit into your little guy. He is spiritually beautiful! Thanks for sharing the pics of your son. Peace, love and light to your family. No doubt that you are his Daddy! Looks just like you — with lots of improvement from his Mommy! Job well done. As smiling as dad is… nice pic and thx for sharing. You are right Claude, he is adorable!! In my opinion, being a dad is the greatest thing ever, and the best part of my life, I have a daughter and a son! Be the best dad you can be, all the time! And enjoy EVERY moment! He looks just like his dad , so happy for you what a blessing , take care . Your fan ronnie. Way to go Poppa Johnson. My Son is 30 and about 14 I got him a Fender Squire. At 17 I got him a Fender Standard and played in a band with him for 5 years before he started his family. Early on we were on stage at an open band jam and he said “I am gonna do a song that my Dad first taught me, Red House. I hope you like it.” Just one of the many memories. And his older Sister is another story. But I won’t share her story until you have another. Peace! Very cool!!! Thats one happy looking little guy. Big guy looks right happy too. Congrats man. Unbelievably cute. By the way, I took your chord progression from a couple of weeks ago and added a bridge to use for background music for my home videos. I thought you might be interested. Also, thanks for all of your posts, I love the free tips. I am 75, and don’t read music, but still learn a lot from your posts. Since I was warming up with your chords and it was autumn, I named it “Autumn Jam”; without your wonderful posts, I never would have been able to make this. Your baby is adorable! So lovely being able to put a face to the pic I’d imagined. He’s lovely and experience tells me you will soon be enjoying his company more and more. Enjoy and congratulations (obviously to Mum and Dad). Yeah look at that smile! I’ve had two grandchildren in the past 3 months and man, what a thing to watch them grow! Youlern so much don’t you? Congrats man. Enjoy this time of your life, as all to quickly you’ll be waving goodbye as he heads off to school then to university and who knows where from there. He looks just like you, short, a little chubby, double chin and receding hair line. Take lots of pictures, if you don’t you’ll kick yourself when he is a little older. Keep on picking’, just save some time for the little guy. LOL 2 more Claudes. They look exactly like you, especially the top pic!! I don’t generally think babies are all that cute but I must admit that’s one cute kid. Who’s the dad? Just kidding. Thanks for sharing pics of your new son. He is very adorable. I know your so proud of your son. And you should be coz he’s your perfect baby boy. Ive prayed that our Lord will richly bless your son’s life and that he will have a close relationship with God. Is this dvd going to help me get to that next level? You may be biased, as all us parents are, but your son surely is adorable. You’re definitely the proud Papa. Thanks for sharing! Thanks for sharing. I can tell you right now he’s going to be a great guitar picker. I can see he has beautiful fingers just waiting to grab that axe. Also, he has fabulous ears which will serve him greatly in his life’s musical journey. He’s definitely going to make you very, very proud one day. Beautiful son Claude, and I think you’ll make a wonderful parent because I sense you have a lot of love and patience in you. Your friend, John H.
Good looking baby! Your life has changed! Embrace the change. Congratulations. He is your double, spitting image of you. Adorable is right. You and baby look like you really enjoy each other. You look like a proud Pa Pa. Good for you and your wife! Blessings upon you and your family. For years I was a loner and a partyer. And one day I partied a little to hard and found myself lying in bed waiting to dye when a angel appired to collect my soul. And I asked why my life was the way it was and he said cause that’s the life you lived. And that if I change my life would too. I stopped partying from then on and within a year I found out I was going to be a father at 47. Well it turns out to be the best thing that ever could happen to anybody and my boy is the apple of my eye and the only thing that gives me purpose. Enjoy the time you spen with your child it only gets better every single day. 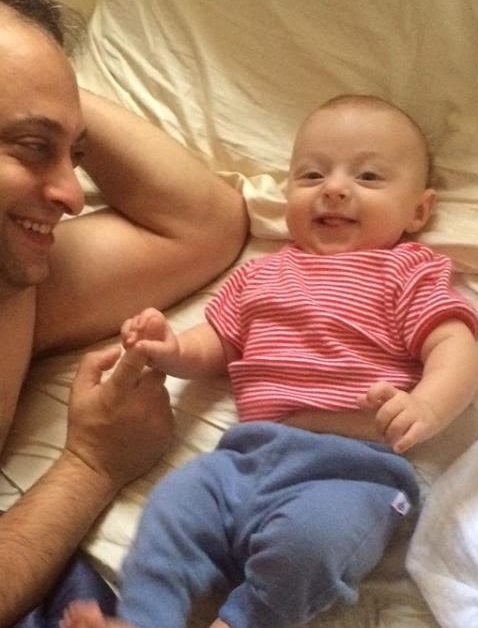 The baby really looks like you – BUT he’s a lot cuter that you (only because he’s a baby). I’m sure you were just as cute at 5 months old. Weren’t we all? Get him started early on the guitar or whatever instrument will be his passion. Very cute and lively youngster. He’s got a great smile like you have. for the forginess of our sins. Congratulations on having a great looking son! I know your proud man. Oh enjoy your lessons & tips, their GREAT! Jason IS cute, must take after Mom LOL. Same thing happened to me, three sons and one princess, all players to some degree, look more like their gorgeous mother than me. Great pics. Such a cute little baby. Congratulations on your new arrival. Have a blessed day. My best to you and your wife and baby. What a proud Dad you are. Congrats. Hey Claude! Great looking boy you got there! But where’s his guitar!?! Beautiful – just beautiful ! 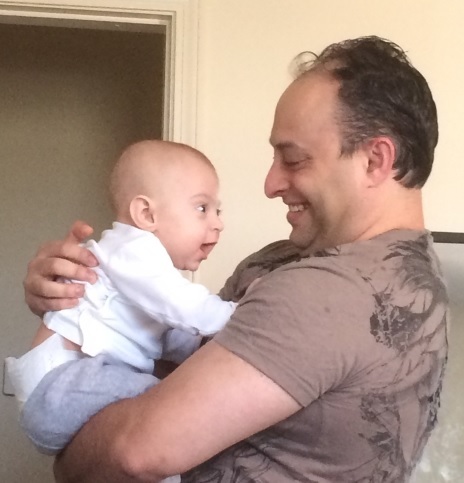 I’m crazy about babies & children ( I was a Health Visitor for many years here in England) – & for me it’s wonderful to see such a wonderful father/child interaction. My ‘baby’ is now teenager but I love him just the same & would do anything to help & protect him. Those are really good pics. I bet your a great dad! Thanks, George. Wow, nice looking fella yuo have there. Welcome to the club my friend. As I am sure you now already know, your life will never be the same…wich is how it should be. Mine are all young adults now but nothing changes, they are your babies forever. Again, well done to both of you and congratulations! WoW! Congratulations Claude ! What a BEAUTIFUL BABY BOY ! So glad he ended up with his mother’s looks. Great little kid Claude but I would rather have a Pug. Lol. I love your photographs of you looking typically proud and happy with your son. There is nothing like it, wait until the hero worship kicks in. It is often easy to forget that our children are the reason we have purpose in life. Regrettably we lost our son to an insidious form of cancer a year passed September. I do not mention that as a downer. Enjoy each and every day you share with your son / family, they are the best you will ever have. The guitar playing and teaching are a bonus but sharing that time with your family beats all. Thank you for showing, us your students, the photographs. Congrats to you both Claude, cute little fella, looks like you both have the same barber LOL. Enjoy them while they’re young, time passes so fast. You are both so happy, have a wonderful life, I just got 2 kittens, my babies, they are brothers. Cheers! Fatherhood looks great on you Man….congrats! Cute kid. Thank God he takes after his mother. You’re right Claude. He is adorable. The first picture is my favorite. He seems like he is excited because daddy is there. Hi Claude, he is adorable. He looks so happy as do you. Look at him laughing already. I love to see babies laughing, they are so cute. Enjoy. Happy lookin’ little bloke!! Great pics Claude. Thank you for sharing and thank you for the fun guitar lessons! He’s definitely a cutie, my two sons are the joy of my life. Your son looks happy and I can see the joy on your face. God bless your family Claude. Chip of the old block. Has he started playing blues yet???? Beautiful boy Claude! Conceived in love and take that emotion to previously unimagined heights. It doesn’t get any better,the pinnacle of joy, Congratulations. Adorable and he resembles his daddy, very sweet! Precious! Priceless! Adorable! The fotos tickle me pink! He looks like such a happy little guy. You guys are a match made in heaven (besides being identical!) Congrats!!!! That’s what it’s all about! Nice pix Claude. I can see that you are very proud, as well you should be. Cool brother. My “boy” is 25 now. Bought him a Gibson/studio for his 21st. My dad bought me a USA Fender strat for mine. He’s a gem. They get big quickly. congradulations you’re bleesed for life. He looks like you except he’s good looking.thanks for everything. All my best wishes for you and your son. He is a great looking little guy. Must look like his mother, No offense meant!! Hope you are not a real sensitive guy! Just kidding, this is what people said to me when I would show pics of my kids. Adorable! (Baby,not Dad)….He’s already paying attention to you, so start the music training! He’s awesome Claude, beautiful boy. Congrats brother. Your life has just started. You certainly can’t deny that beautiful baby. Dead ringer for his daddy! So happy for you! You are beaming and I love it!